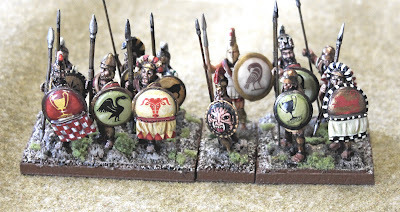 Yesterday in the mail I got my copy of the new Osprey skirmish rules, Men of Bronze Ancient Greek Hoplite Battles, a day before its official release. I've really been looking forward to these rules, as I have numerous armies for the period (Marathon to Chaeronea) and they are based on Dux Bellorum, my favourite dark age rules. 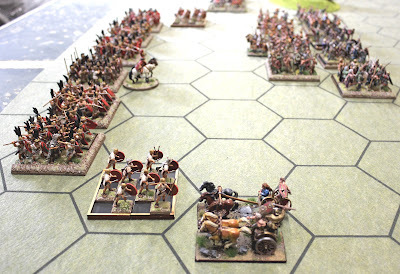 After reading the rules I was disappointed for a variety of reasons but decided to try them out with a solo 38 point game with Spartans and Athenians of the Peloponnesian War meeting in a decisive battle. 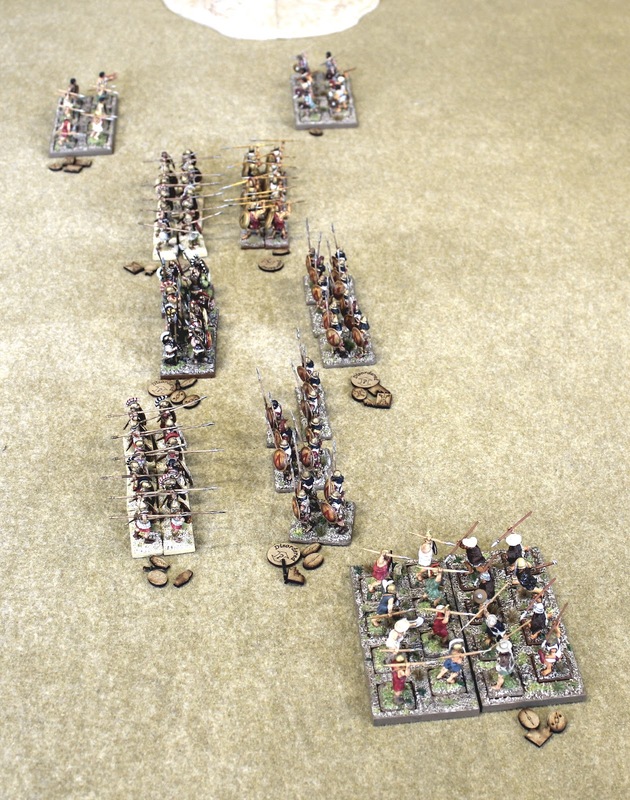 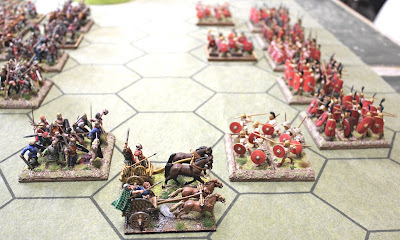 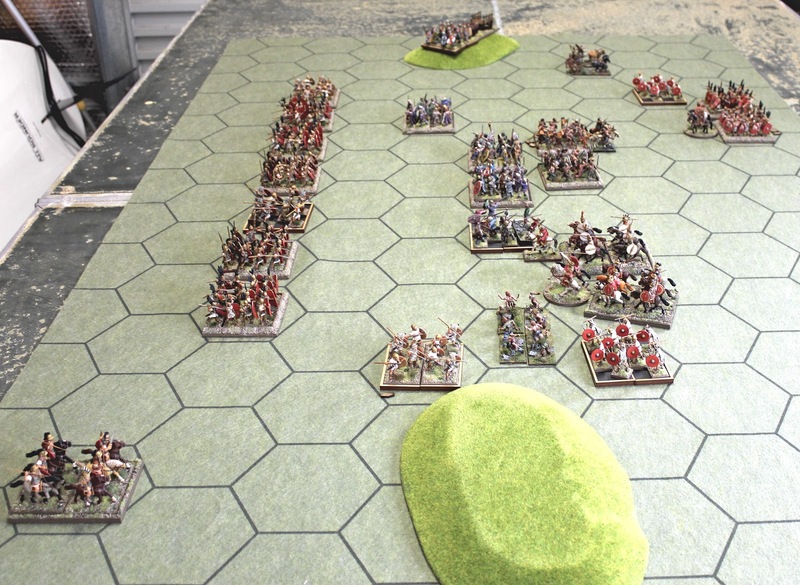 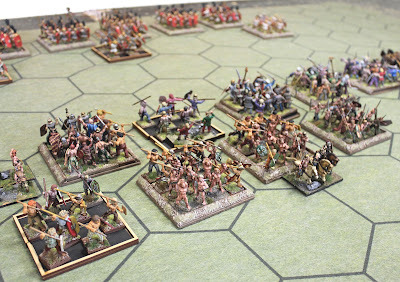 One of the things I found confusing about rules was the measurements in base widths as Hoplite units move 6 base widths which is doubled to 12 when charging. 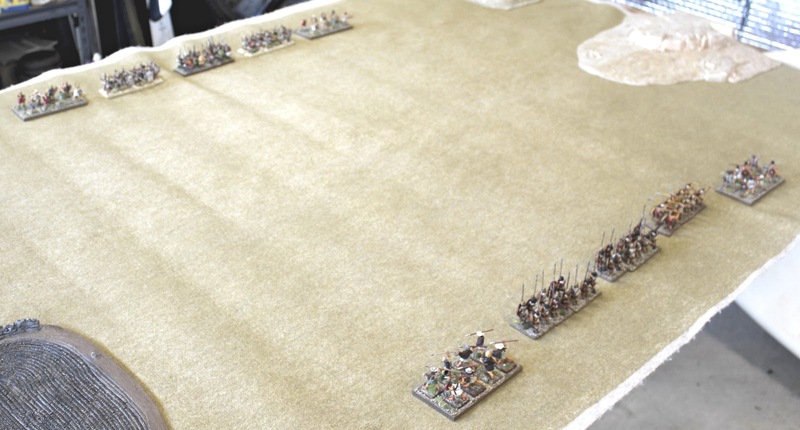 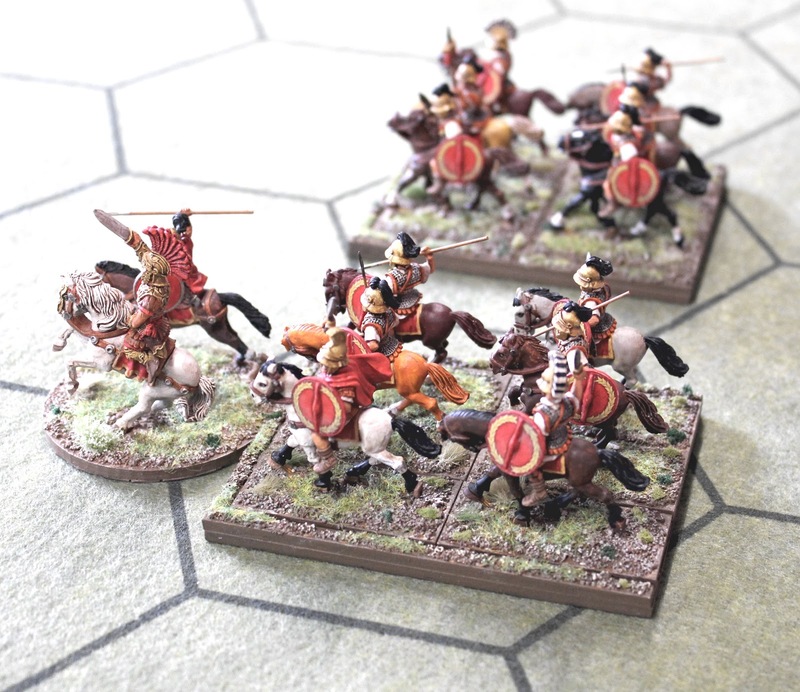 In Dux Bellorum the standard infantry move is 2 base widths or 3 for impetuous warriors charging. 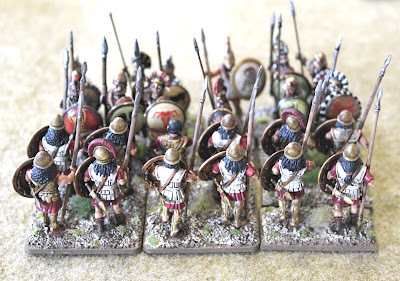 I think this refers to a single base width as all the figures in the photos are 28mm based on single circular 25mm bases, so in effect a single base width equals 1 inch and this is what I went with in my game. 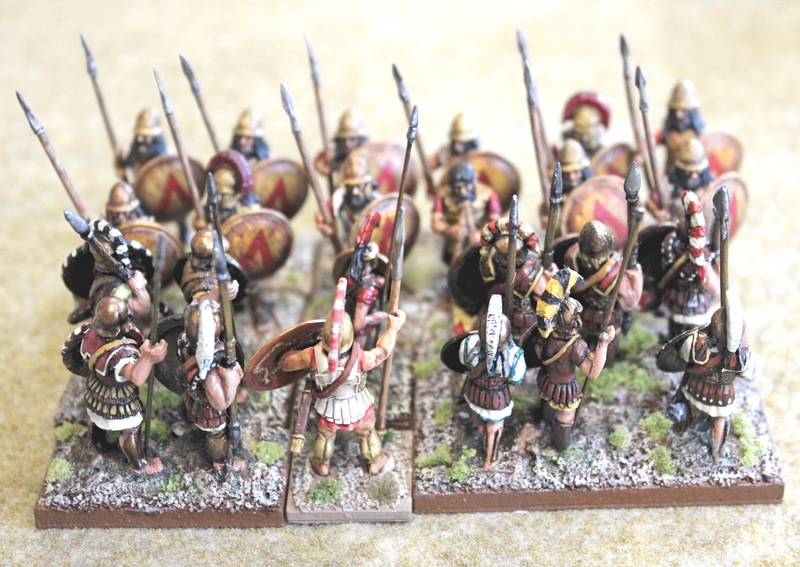 The Spartans had three hoplite units (2 Elite and 1 Drilled) and two units of Helot Psiloi. 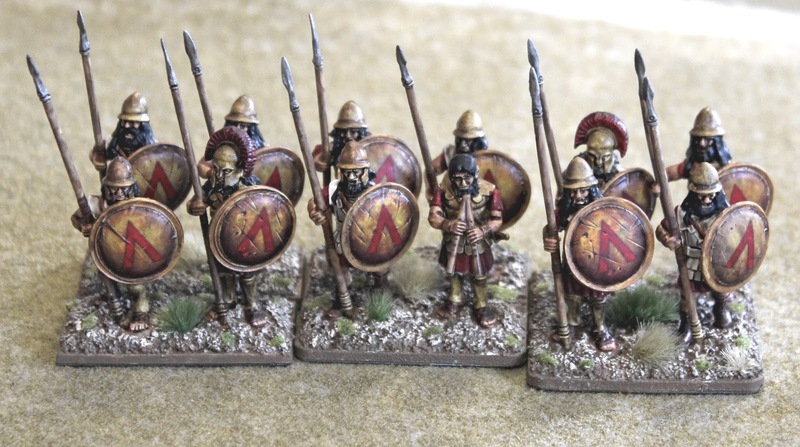 The Athenians had three hoplite units ( 1 Elite, 1 Drilled and 1 Militia) and two Peltast units. 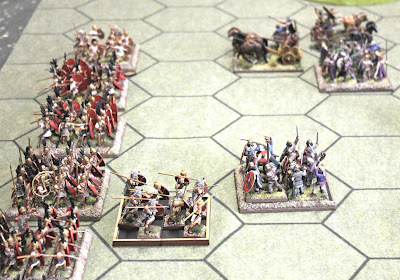 Both sides started the game with six Arete Points each (arete means excellence in Greek). 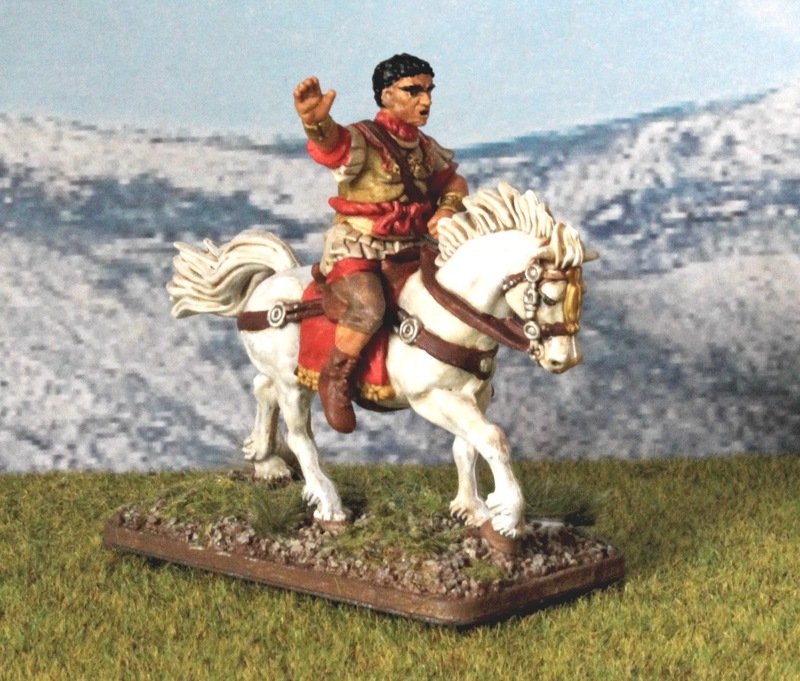 These are similar to Command Points in Dux Bellorum and are used to bid for Initiative, charge, use a special rule, steal Initiative from your opponent, rally a Wavering unit and re-roll any one die. 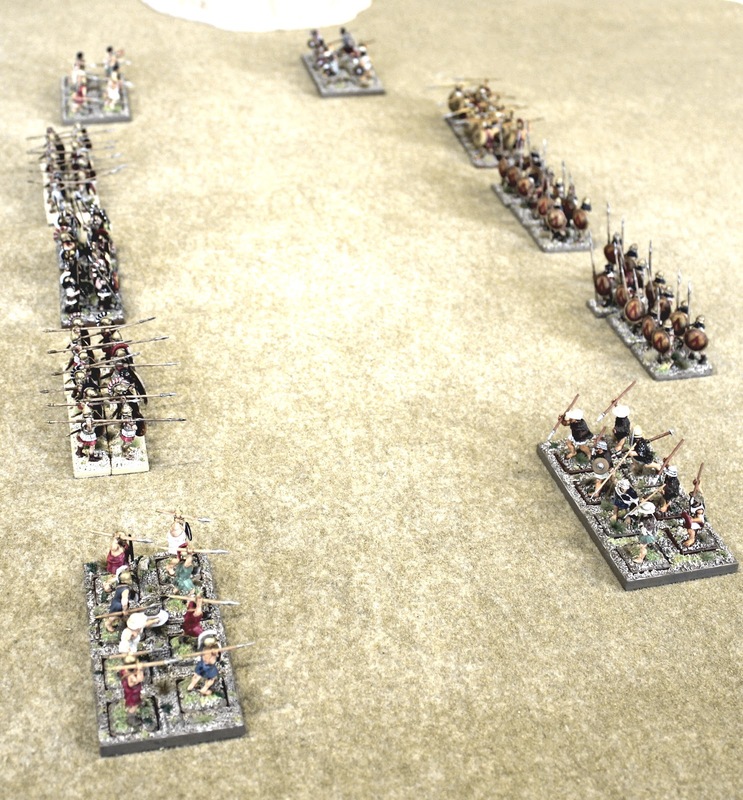 In the centre the Spartans charged and the Athenians counter charged. 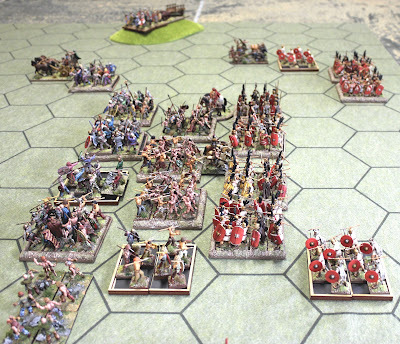 The slogging match continued with units on both sides wavering and courage faltering. In the end two units on both sides bizarrely routed at the same time! A hoplite and skirmisher unit remained on either side, three units then failed their discipline tests, leaving a single wavering Spartan hoplite unit victorious. 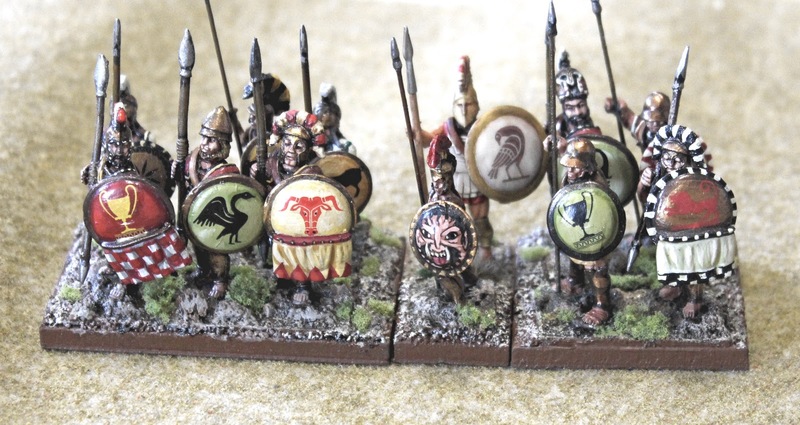 I feel ambivalent about these rules but may try them again with Greeks and Persians or Thracians (Hill Tribe Barbarians). 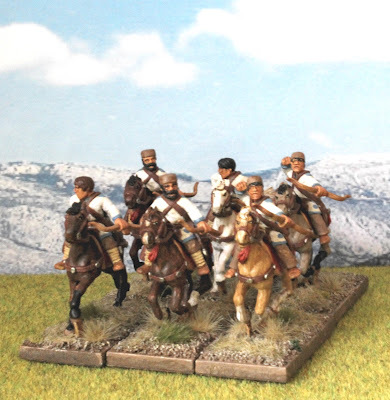 The last two army lists are very generic and seemed to have been added as an afterthought and do leave quite a bit to be desired in terms of historical accuracy. 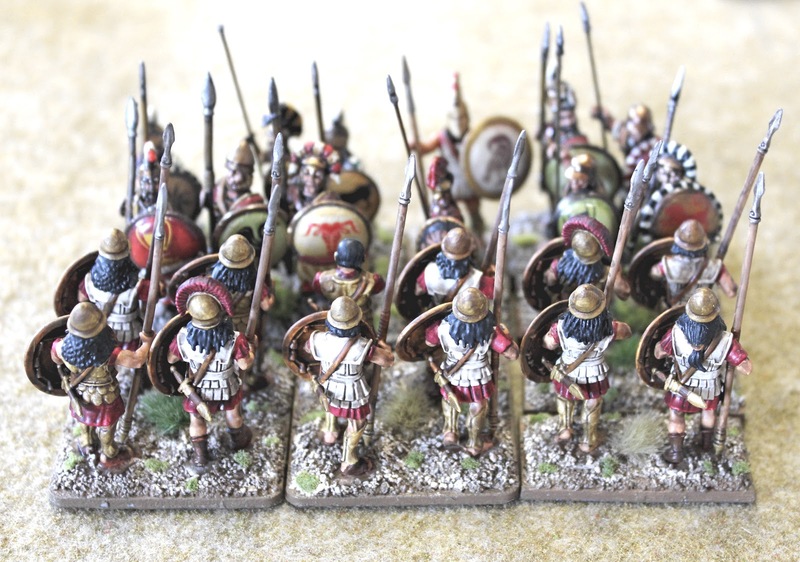 For me this is the main problem with this rule set and having major battles like Marathon, Plataea, Thermopylae, Cunaxa, Leuctra and Chaeronea reduced to skirmish game scenarios just doesn't really cut it. 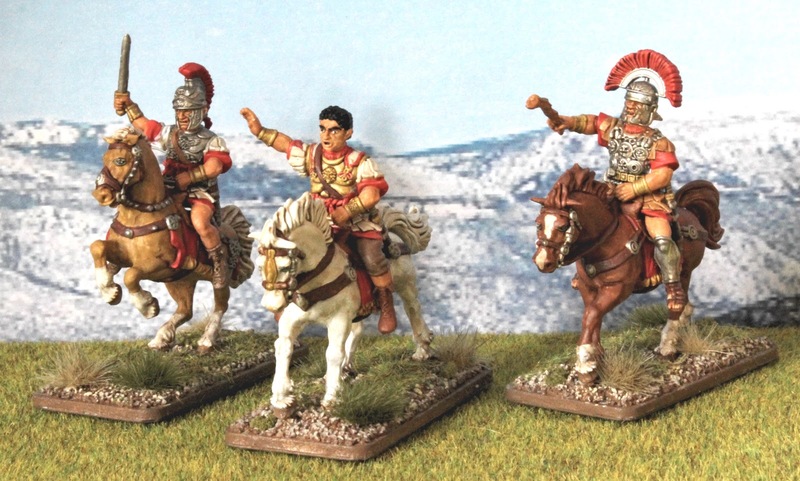 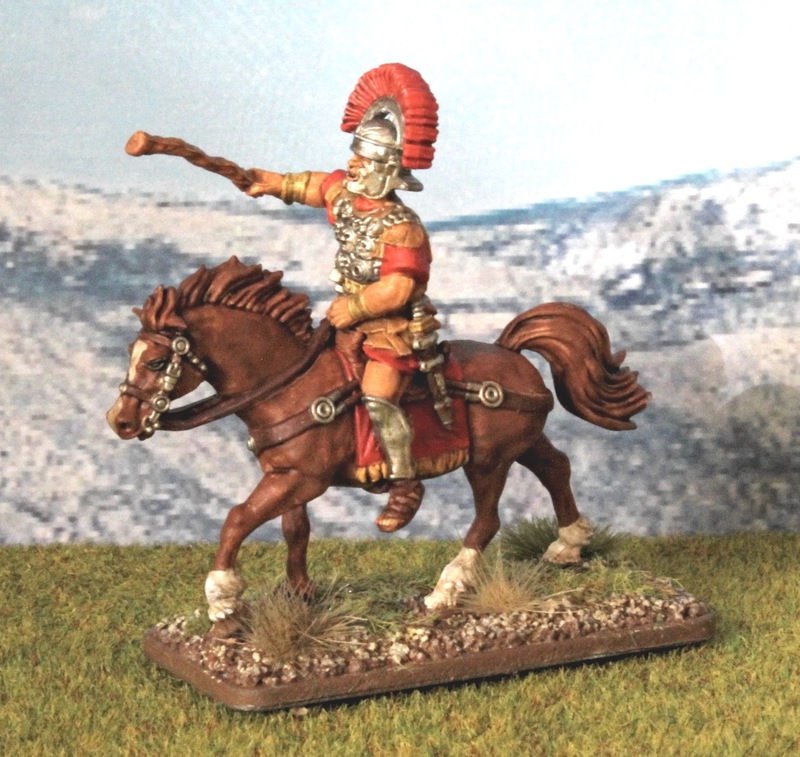 Here are some Early Imperial Roman command figures that I've just finished painting. 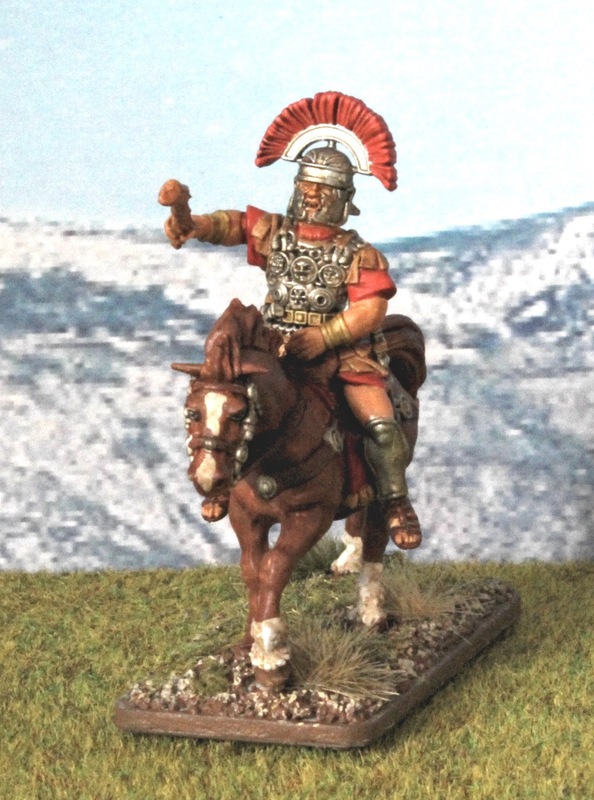 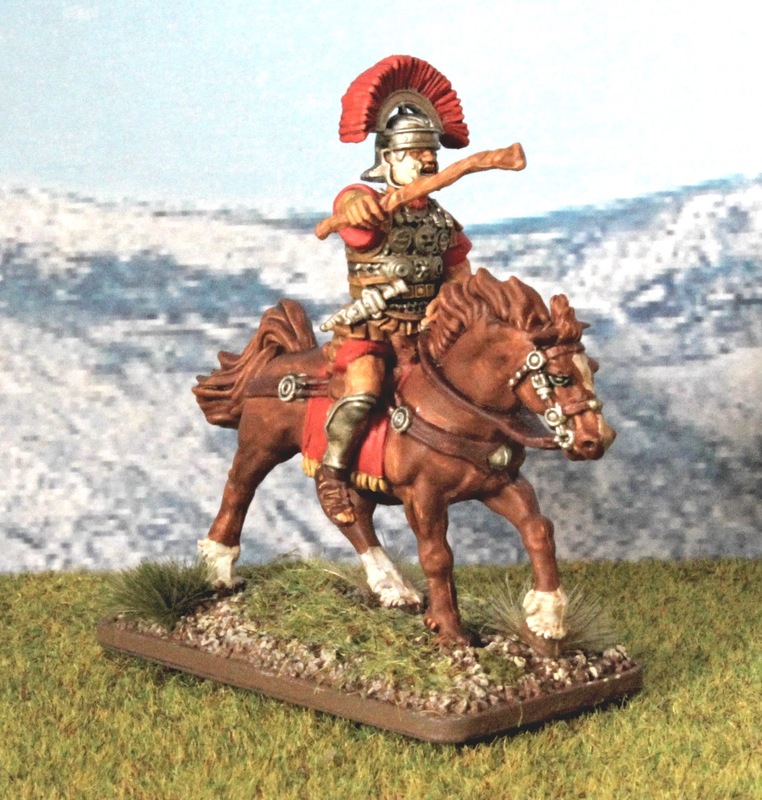 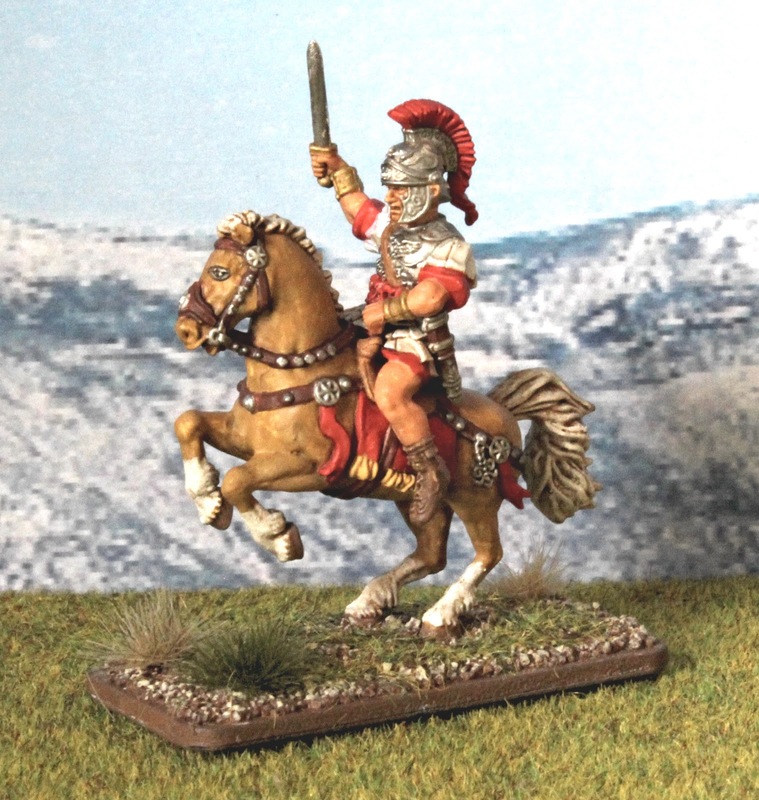 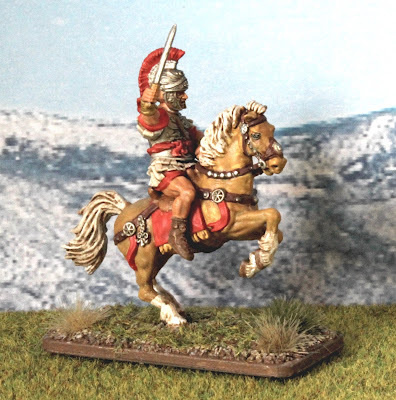 These three figures are one sprue, from the new Victrix Early Imperial Roman Mounted Generals plastic set. 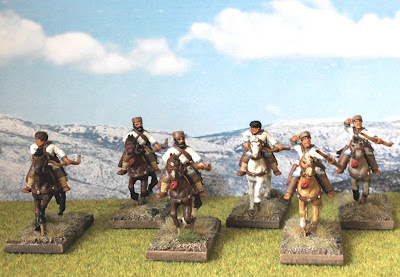 These are great figures which made it record time from the UK. I think the mounted centurion is my favourite out of this lot. I have some Victrix EIR legionaries and auxiliaries to paint so hopefully the command will inspire me to get cracking on those. 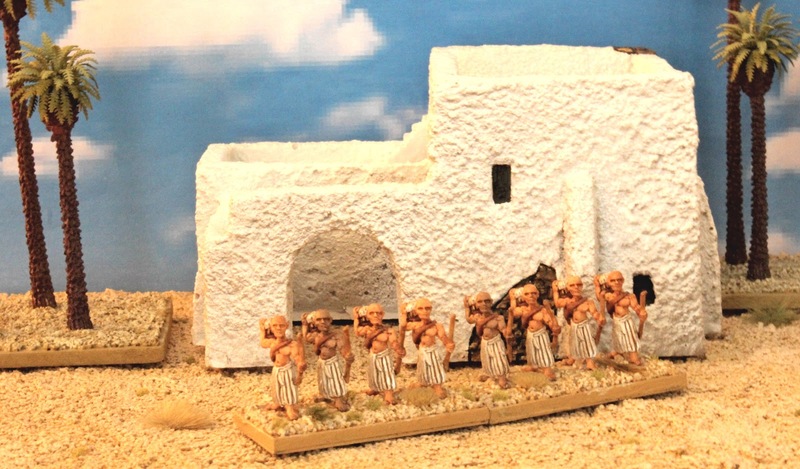 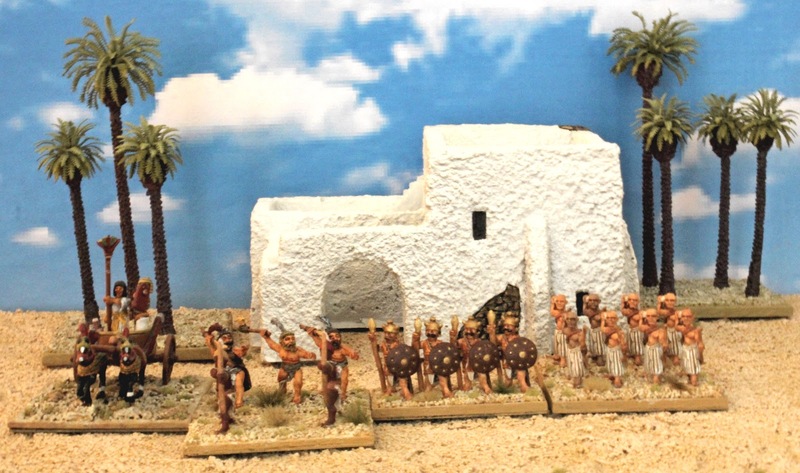 Here are some 15mm New Kingdom Egyptians, there are six elements to date, half of a DBA army to fight my 15mm Hittites. 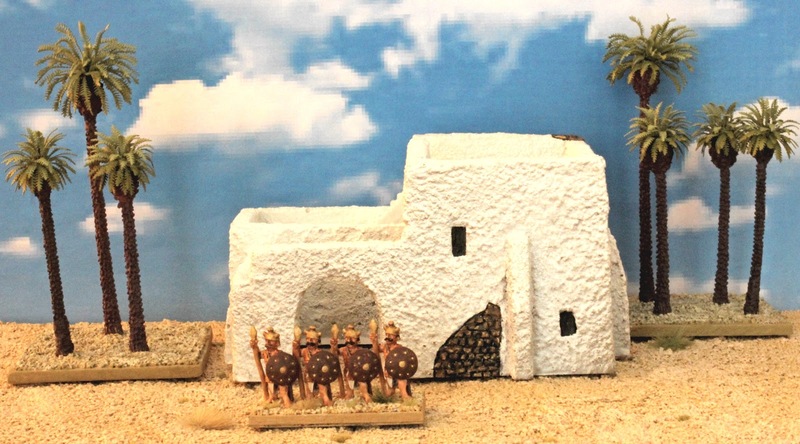 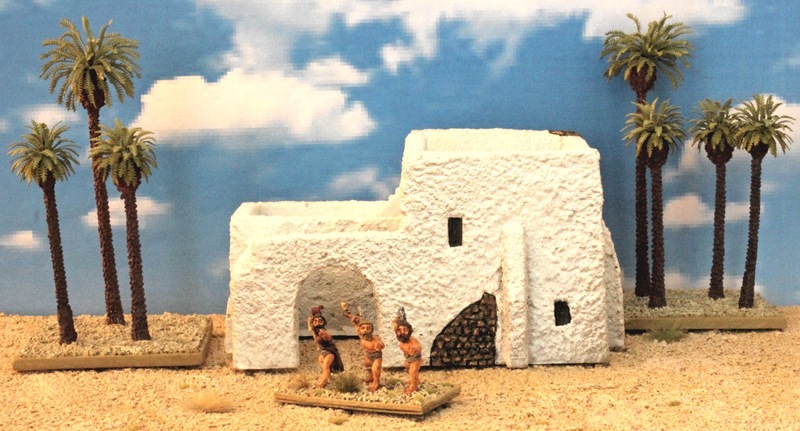 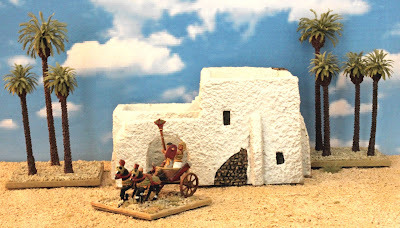 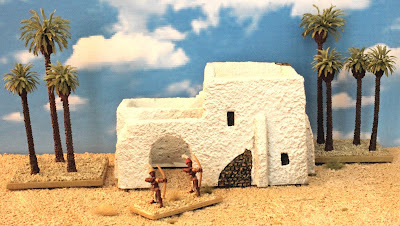 The figures are a mix of Essex Miniatures, Chariot Miniatures, Black Hat Miniatures and the mud brick building is by Hovels. 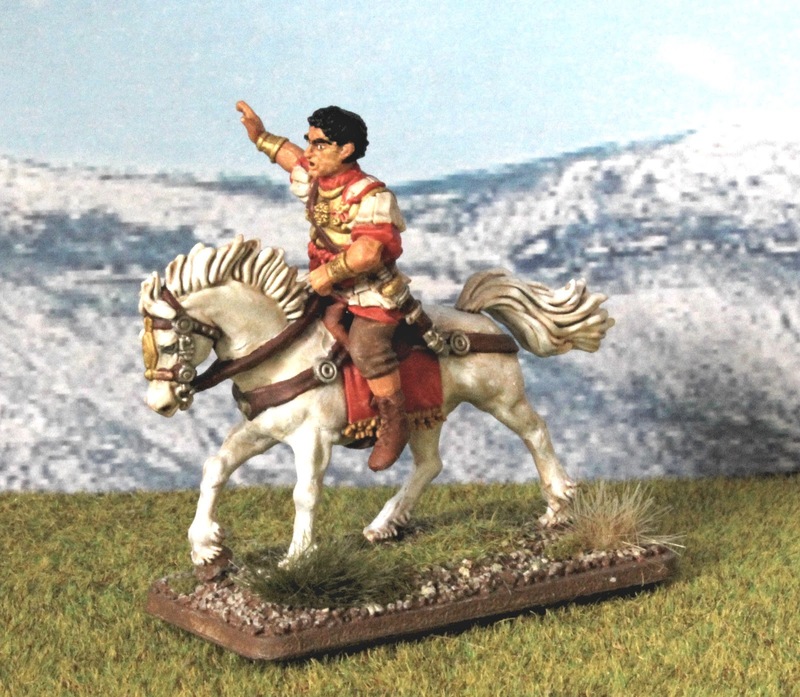 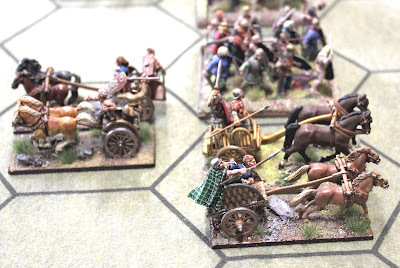 The chariot and horses are old strip Minifigs and the standard bearer and driver are by Chariot Miniatures. All six elements - half a DBA army! 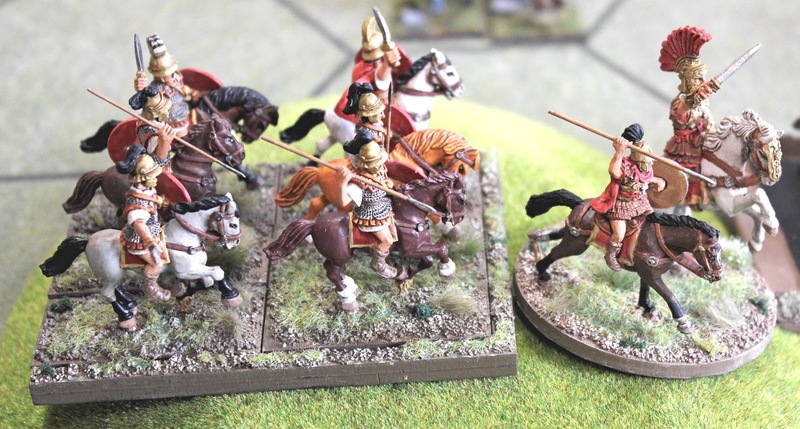 Here are some Late Roman horse archers. 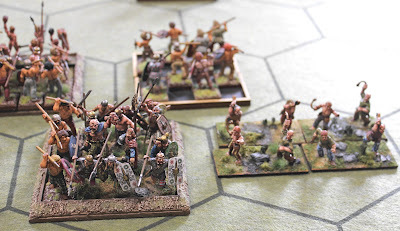 It has been pretty quite on the gaming and painting front lately. 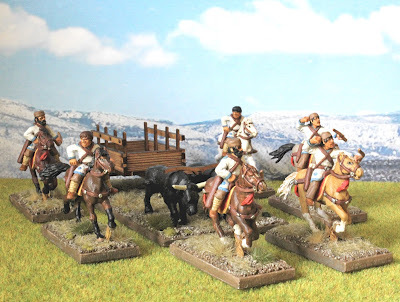 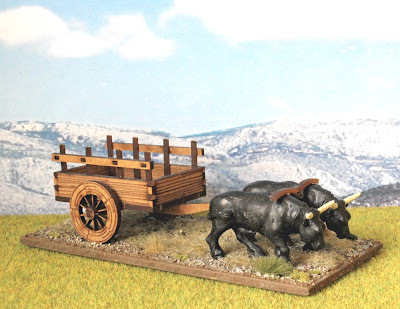 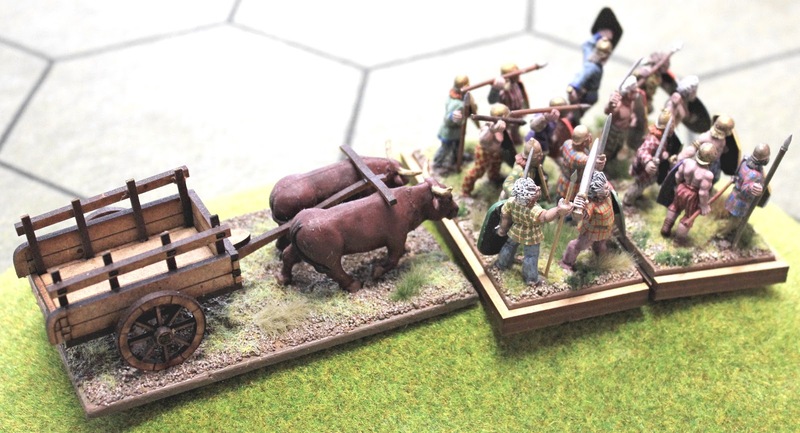 These figures are by Footsore Miniatures and the ox cart is by 4G and the oxen by North Star Miniatures. 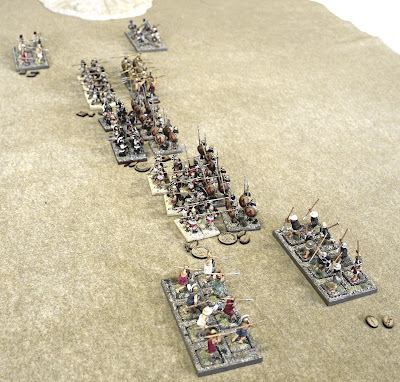 A lot of DBX rules require a baggage element for a camp so this is quite handy for that purpose. 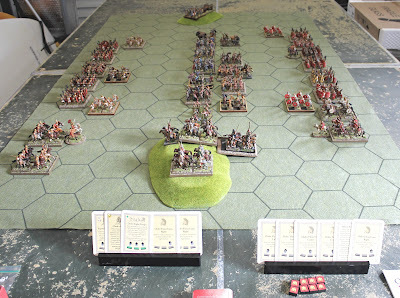 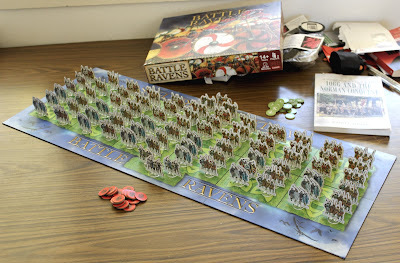 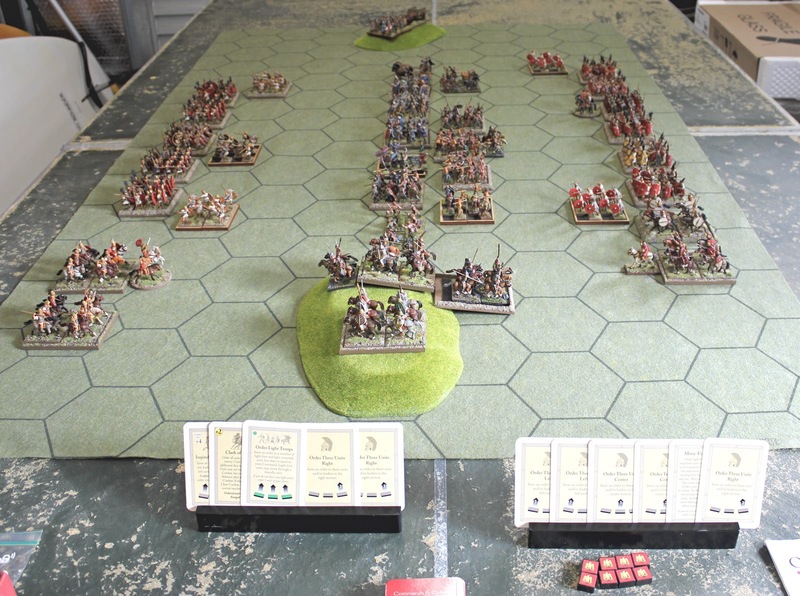 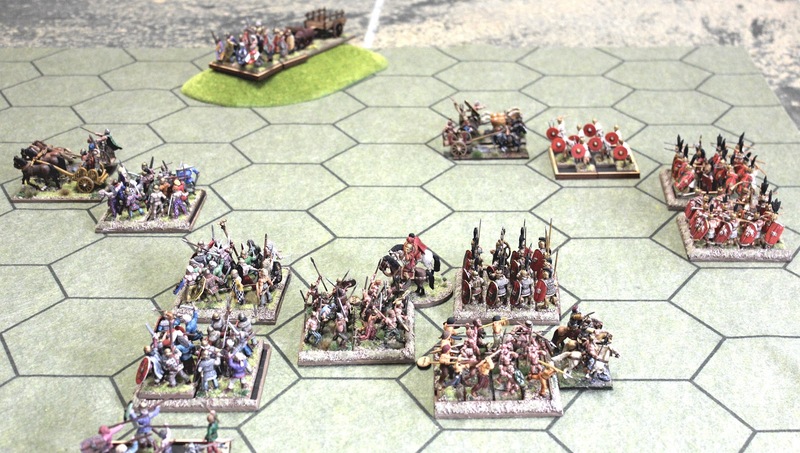 On Wednesday I played a solo game of the Battle of Telamon with Command and Colors Ancients. Telamon was the choice for this year's Society of Ancients Battle Day and there is an excellent article, by Duncan Head on it, in the latest issue of Slingshot (Issue No 322). I used this article and a slightly modified Command and Colors scenario for my game. 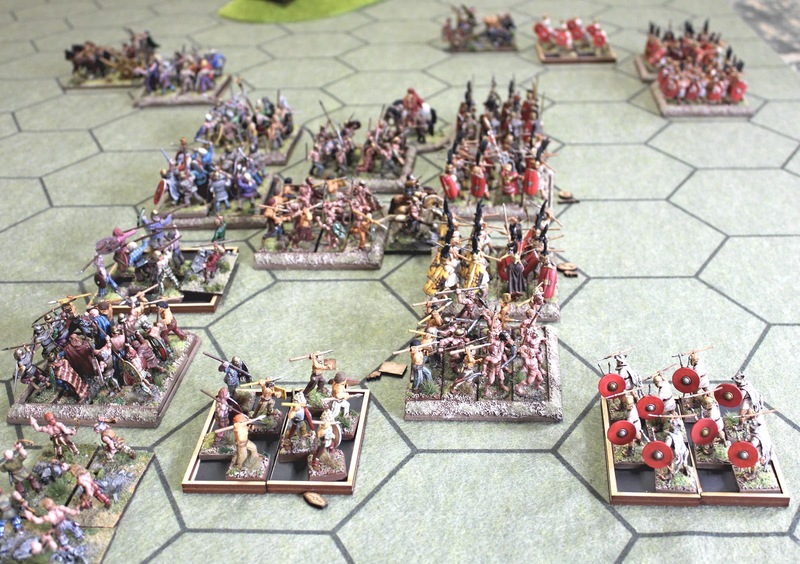 This proved to be surprisingly close and the Gauls, certainly gave a good account of themselves. 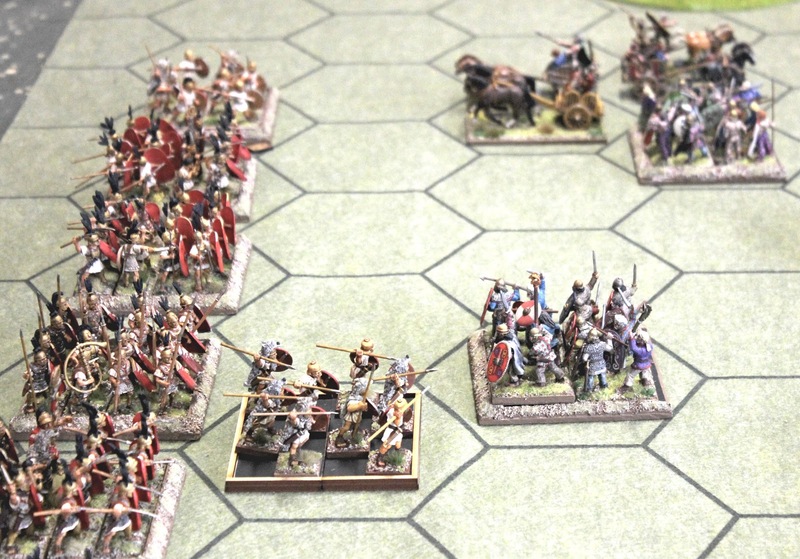 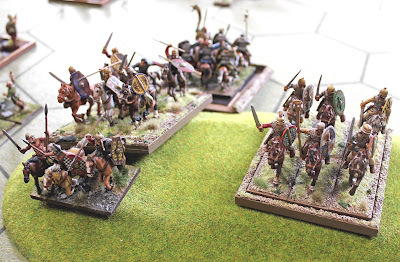 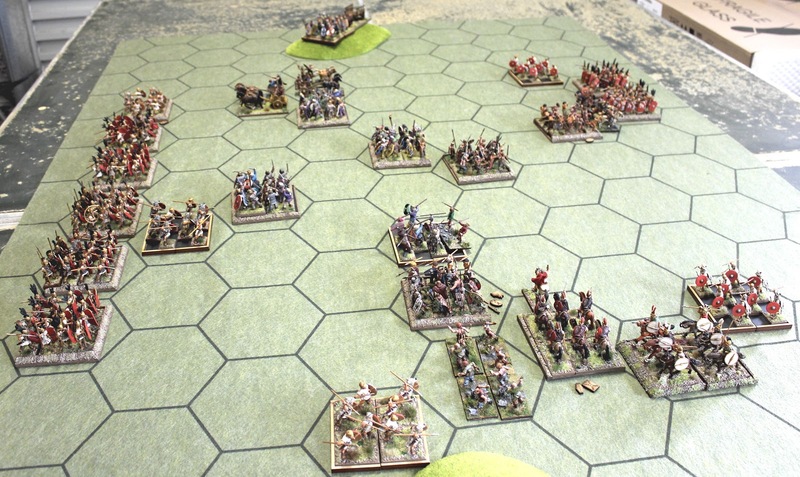 The Romans got off to a flying start by charging and routing all of the Gallic cavalry and killing one of the Gallic commanders, in the first turn. The Romans played a Double Time card and launched an attack on the Gaesati and Insubres with equal losses on both sides. 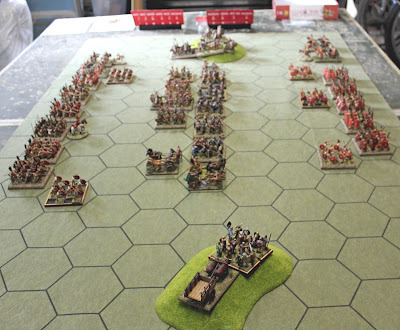 The Gauls responded with a Clash of Shields card and were able to destroy Aemilius' infantry centre. 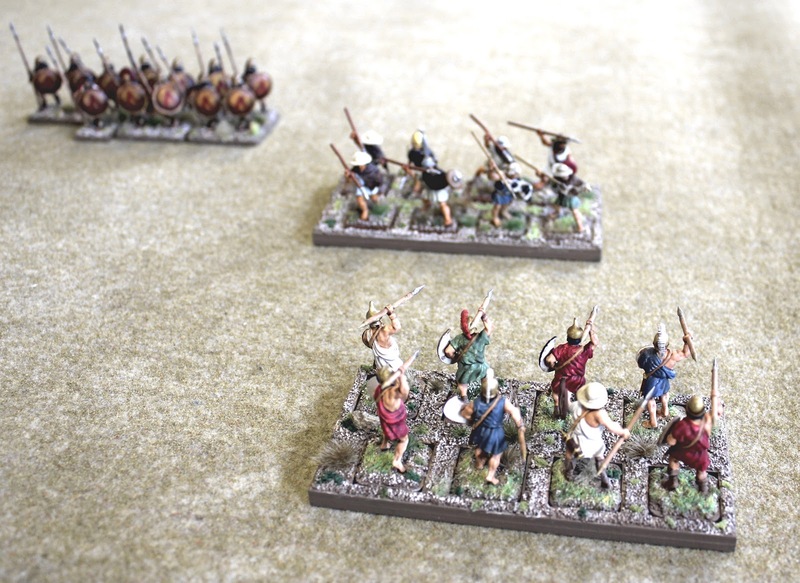 The victorious Roman cavalry on the hill counter attacked and were able to grind the Gallic infantry down. In the end the Romans won by 8 to 5 Victory Banners.